This is the first of a five-part series for newbies to WordPress. Be sure to join me each Monday for the next four weeks to learn how to set up a WordPress site. Have you seriously entertained the idea of having a blog*, but start to shake at the thought of having to learn yet more computer stuff? Do all those tech words leave you glary-eyed at just the thought of really having to comprehend them? Then you are certainly not alone. 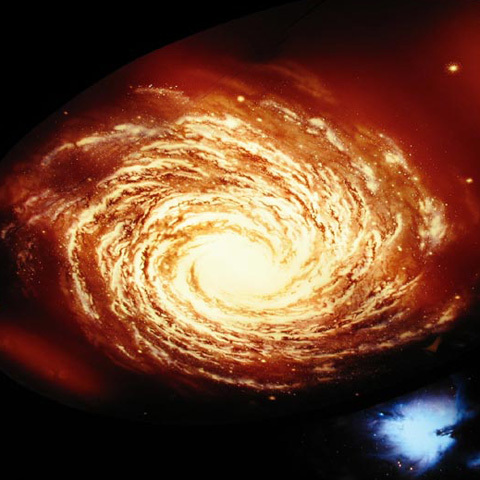 I felt this way for quite some time before deciding that my business was pushing me to move forward, to go, as the Star Trek phrase puts it, to “the final frontier…to explore strange new worlds”. The thought was both scary and exhilarating at the same time! I told myself, “I can DO this”. And so I did, and so can you. *Blog-Web site containing the writer’s or group of writers’ own experiences, observations, opinions, etc., and often having images and links to other Web sites. First I’d like to write a word about where to blog. If all you really want/need is something simple, then I understand that Blogger might be perfect for you. I say understand because personally I have not used it, but rather went directly to WordPress to start my website, as I read it was more customizable. I also was really hopeful about adding some e-commerce, or online selling to my site, and wanted software that would be powerful enough to handle that facet of my business. I knew that even if I was not able to include the e-commerce portion, that I wanted to be able to add it at a later date. And so my research began. There are two types of WordPress sites, those created on WordPress.com and those created via WordPress.org. WordPress.com sites are hosted* on their server*, and are free. Free, however, does have its limitations, including the fact that you are limited to the amount of storage you can have, and you will be unable to fully customize your site. There are also rules about having ads on your blog. The second option, and the one I chose, was to use WordPress.org, which meant I would have to pay a third party to host my site on their server at about $5-$10 per month, and would have to purchase my own domain* name for about $10 a year. *Host/Server-the business of providing various services, hardware, and software for Web sites, as storage and maintenance of site files on a server. Everything, really! In my case I had actually reserved a domain name several years earlier, so had that part taken care of. You will need to find a host for your site, and can make your purchase of a domain name through them. There are many good host services out there. My site is hosted through IX Web Hosting (http://www.ixwebhosting.com/). I did a little research on good host sites, and read nice reviews on this one. I must say I have been very pleased with them. I have been able to phone them 24/7, which is so important when you are learning and need great support from the company that will be hosting your website. Their staff members have always been extremely pleasant, no matter how ridiculous I’m sure some of my questions have been to them. Whatever company you decide to go with, make sure they have good customer service. If you already have a business, you might be surprised to find your business name already being used as a domain name, in which case you will need to choose a different, perhaps similar, name for your website. A great place to check for domain names, as well as social media names, is Name Chk. It’s probably also a good idea to look online at http://tess2.uspto.gov/to make sure your chosen domain name is not currently being used as any type of trademark, because you don’t need any kind of infringement issues. If you don’t have a business but just want to create a blog, you should have more options for a domain name that is not already registered. Be prepared, either way, to go through several name choices before finding one that is available. The problem here is that there are folks who purchase domain names to later sell them, which can make finding a good name more difficult. Be patient if your first choice is not available, there are still lots of good domain names out there! If you are just doing research now and don’t want a website until later, you might want to at least register a domain name you like – if it’s currently available – so that you will have it at a later date. That’s what I did several years ago. So now that you have a domain name and a host, it’s time to install WordPress to your host’s server and select a theme. We’ll discuss that next week in Part II of this series. 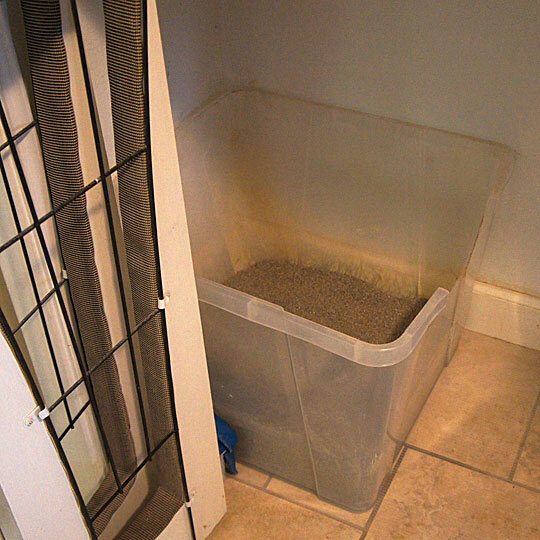 This is the second part of a two-part article on solutions to typical litter box issues. So, here is another delicate problem I’ve been forced to resolve with my cats and the litter boxes. I call it high peeing. Yes, you read that right; I have cats that stand to pee or “spray” in their litter box. 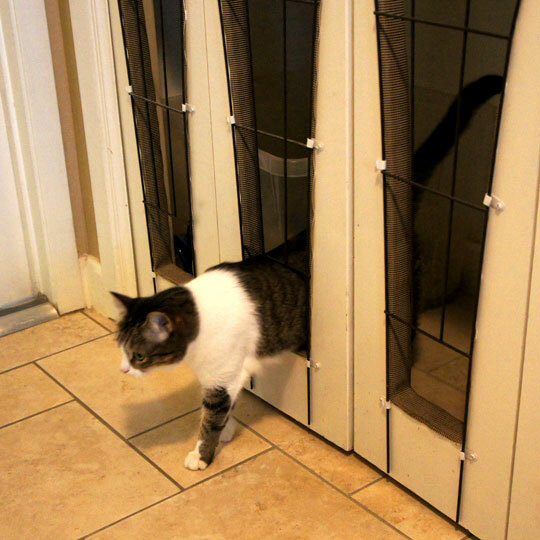 The solution to this problem initially seemed like a simple one – just get a litter box with high enough sides to allow a cat to stand and urinate. But it turns out this was not such a simple idea. I measured the space in my newly designed utility room closet area to determine the largest litter box size that could be accommodated. I also wanted to be able to fit two litter boxes in this area, and decided that two 20” square boxes would be the largest size I could use, and they needed to be a minimum of 15 ½” deep. Deeper would be even better! This would allow for approximately 3-4” of litter to be placed in the bottom of each box. And this is just my opinion, but I firmly believe in having “open” boxes for cats. They say cats have noses that are 14 times more sensitive than human noses, and personally the idea of porta potties is not something I find pleasant. Can you imagine with their sensitivity to smells how cats must feel having to use a litter box that is dark and confining? 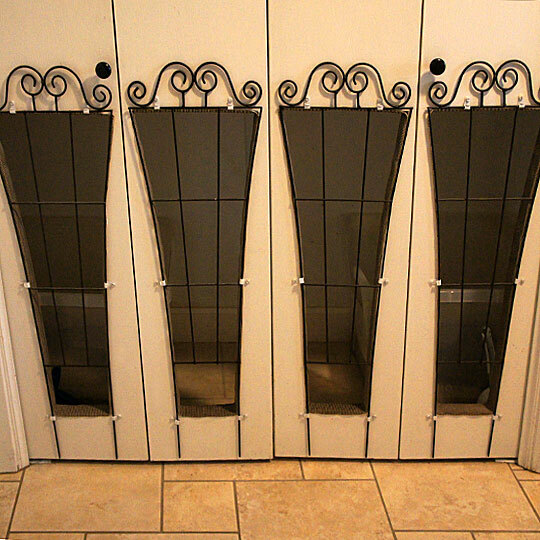 Knowing this, I wanted boxes that were open at the top and made of clear translucent plastic, to provide the cats with as much open and visible space and fresh air as possible. Having the boxes open at the top would also make them easy to clean. Lastly they needed a cut-out for the cats to step into the box. So once again I went on the hunt. I went to all the big-box pet stores, Target, and Walmart, looking for the perfect boxes. Pet store litter boxes all had sides that were way too low for my needs. Finally, after finding nothing, I ended up purchasing two perfect size translucent plastic boxes at The Container Store, and had to do the cut-outs myself. I used a cardboard template and drew my lines, and then used a jigsaw for the cuts, and then sanded the edges once the cuts were made. Perfect! I have to tell you that once I had the two new litter boxes in place in the closet, the cats quite literally lined up to check out their newly remodeled bathroom. They gave me 16 paws up! I know of at least three friends that have this very same problem with their cats. I hope there are some litter box manufacturers out there listening, because apparently my cats have a rather common issue which manufacturers have yet to address! 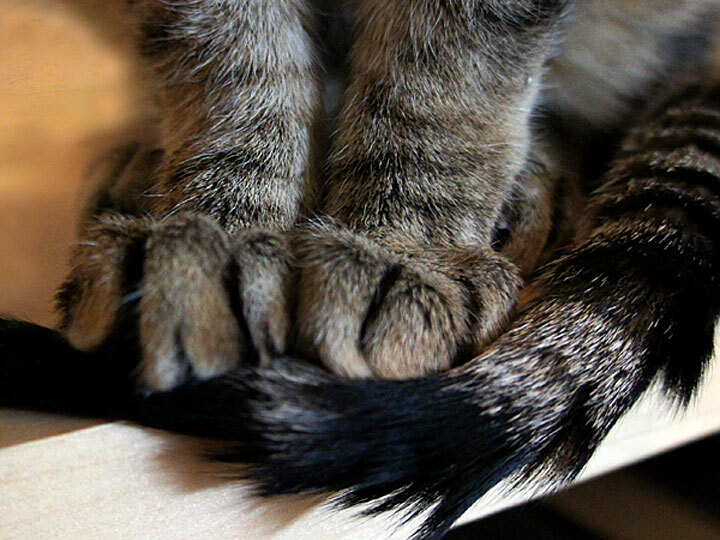 Have you found solutions to any litter box issues you might have? Caska poses beautifully, with her paws on her tail!